Salem College will break ground on December 5 for a new residence hall that will be located north of the main campus, at the corner of Church and Cemetery Streets. Salem’s Board of Trustees recently voted to add new and/or renovated residences at the Academy and College, among several critically important projects, in its Master Campus Plan. New housing for the college is the first project in Salem’s plans for residential expansion. Construction is slated for completion in the late summer of 2015. This announcement follows three consecutive years of enrollment growth, including the largest incoming class in the history of Salem College (representing a twelve-percent increase). The four-floor, 32,000 square-foot rectangular building will provide nearly 90 beds in an apartment-style configuration. Overall cost for the new building is estimated at $5.5 million. “Authorization to proceed with construction gives us an opportunity to plan for renovation of our existing housing, which includes many historic buildings. We will be able to move students into the new residence while we take other buildings offline for updating,” said Director of Administration Anna Gallimore, who oversaw the construction of the Salem College student center that opened in May 2014. Salem has engaged Frank L. Blum Construction to develop the residence hall through a design-build agreement. The team also includes CJMW Architecture and Stimmel Associates, PA. This will be Salem’s first apartment-style housing and the first residential construction in nearly 50 years, since the construction of Gramley Residence Hall in 1965. The building will also provide a new gateway that will connect downtown Winston-Salem and Salem’s main campus and extend the visibility of the 243-year-old campus from Business Route 40. 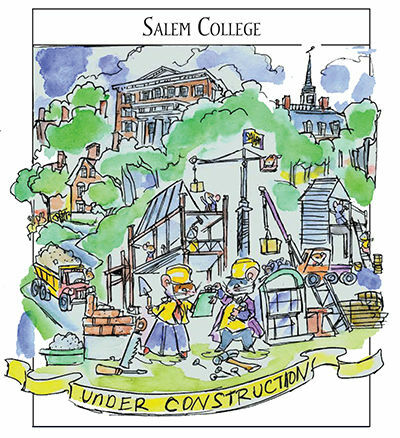 “As the oldest educational institution in North Carolina and the oldest continuously operating institution for women in the country, Salem College is privileged to contribute to the revitalization of the downtown Winston-Salem area. Our new building represents the continuation of nearly 250 years of development, and we look forward to building upon that legacy for future generations of Salem students,” Sterritt added. The public is invited to attend the ground breaking ceremony, which will take place on Friday, December 5, at 4:00 pm, at the corner of Church and Cemetery Streets.